Sleep Number C4 Review- Good Fit For You? Home » Sleep Number C4 Review- Good Fit For You? Sleep Number’s C4 Classic Series mattress is one of the most standard Sleep Number models but comes with a comfort layer that provides body countouring not found in the C2. The C4 could be a good fit for those (mostly couples) ready to take a dive into a Sleep Number bed without completely breaking the bank. and made with a soft and breathable polyester/polypropelene knit blend. Inside the mattress, there will be 1 or 2 air chambers, depending on the size of your mattress. Sleep Number calls this “DualAir™ adjustability” and it allows you to adjust firmness and support on each side of the bed to your Sleep Number setting. The C4 model comes with a 1.5 inch “Comfort layer” of polyurethane foam that features 3 zones of comfort. Sleep Number says the zones are intended to relieve pressure and contour to your head and neck, back and hips. The top of the mattress has the ability to be zipped on/off and features a soft fiberfill material sewn into the mattress top. It is not recommended that you remove or wash any part of your mattress but if you need to spot clean, customer service reps suggest that you use a mild detergent (Dreft, Ivory Snow or Woolite) and sparkling water. Lay the cover flat to air-dry. To sum up, the C4 features: 1 (or 2) air chambers, 1.5 inches of polyurethane foam featuring three zones of contouring support and a soft layer of fiberfill sewn into the top of the mattress. For an additional cost, you can add the FlexFit Adjustable Base, which lets you raise and adjust the foot and the head of the bed. You can also add on SleepIQ Tech (the Sleep Number app). Firmness is an interesting topic with Sleep Number beds. In theory, your Sleep Number will determine how firm your bed is because your number determines how much air fills the air chambers in your mattress. Similar to the C2 model (which has no additional comfort layers) the C4 will also be a firmer Sleep Number mattress because it has fewer layers than other (more expensive) Sleep Number models. You Like Sleep Number Beds But Don’t Want To Spend A Ton: While it is not the least expensive model, those who want a Sleep Number bed and three zones of contouring support, the C4 Classic Series Adjustable mattress could be a good option for $1,599 for a Queen. You Sleep With A Partner: Sleep Number beds are very popular with couples because they allow each person to adjust their side of the bed to their comfort level. If you opt for the FlexFit adjustable base you can also move the head and foot of the bed. You Like A Firm Mattress: The C4 Classic Series model has one foam layer – 1.5 inches of foam between the top layer and the air chambers. It also has a small layer of filling sewn into the mattress top (not foam). This somewhat minimal cushioning will naturally produce a firmer mattress than other Sleep Number models that have more layers of foam in them. You Like Foam Mattresses: Sleep Number mattresses are all about using an air chamber built into the mattress that can be used to adjust the firmness, support and comfort levels of the bed. It is less likely that you will “sink” into the bed like you would with memory foam or latex mattress. You Want To Keep It Simple: Technically, you can use your own box spring underneath a Sleep Number mattress, however, customer service reps told me they recommend you purchase something called a “Bunky Board.” According to Sleep Number customer service, this board is a thin upholstered layer that can be placed between the mattress and your base. Note: Sleep Number does not sell Bunky Boards but they can be purchased online at various retailers. 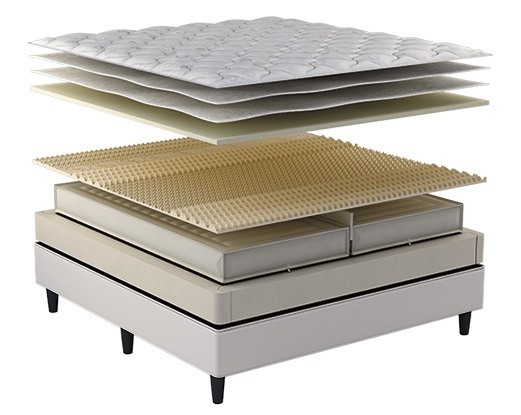 You Are A Heavier Person: Sleep Number mattresses can hold a weight of up to 400lbs per side. A Sleep Number model with more layers and more cushioning may be a better fit for heavier individuals. However, some customers have added mattress toppers to the more standard models, which could be a good (but potentially expensive) workaround. Reviewers love that you can easily adjust the level of support with your remote. Several reviewers spoke about aches and not knowing what was wrong until they tried different firmness levels and found their ideal Sleep Number. Couples loved that they could customize their half of the bed to whatever firmness they desired. Especially for couples who has one partner who likes firm beds and another who likes softer, this seems to be a big selling point. Customers who are dealing with physical injuries like the FlexFit Adjustable Base option with the mattress because it allows them to be propped up or to elevate their legs and feet as desired. The beds can be high maintenance. If something goes wrong or needs repairs it seems like a hassle to go through their customer service system and send out a technician, often for an additional fee despite the 25 year warranty. In C4 models with dual air chambers, some reviewers found that the middle of the bed (the space in between the air chambers) started sagging after a few years of wear. Customers found the C4 model to be overpriced for the quality of the mattress. Some customers were a little underwhelmed because they had such high expectations. Sleep Number mattresses can get expensive, nearly $5,000 for a Queen, which makes the C4 much more realistic at a base price point of $1,5999. Those who are set on purchasing a Sleep Number bed may choose the C4 over the more affordable C2 because they want a slightly thicker mattress and an additional layer of comfort foam, which the C2 does not offer. This extra layer of comfort foam (polyurethane) is said to have 3 zones for contouring support – so individuals who want all the benefits of a Sleep Number plus extra support for the head and neck, back and hips may like the C4. The C4 model could be a great fit for a couple (or individual) who wants to customize their sleep experience and need only a little bit of cushion. Just a step above the base model, the C4 offers an extra layer of added comfort with a 1.5-inch foam layer and three zones of support for your head and neck, back and hips. With some mixed reviews, your best bet may be to utilize the trial period and decide if the mattress firmness and construction quality make it worth the $1,599 price tag (for a Queen). I read their return policy and they charge for shipping if I return it. Do you know what their shipping charges would be if I chose to return it? It does not look like this would go back to my local store. I’m at zip code 34480 if that helps. I have been trying mattresses to help with my back aching and waking me up. I’ve gone thru a few online mattresses that come in a box, the Nectar being the best so far, but I still wake up aching. Those that I “returned” were donated to my local Interfaith store and I received a full refund when I showed the donation receipt. Hi Val, I’m not associated with Sleep Number so you’d have to go through them to figure out the shipping charges! What is your primary sleep position and which mattresses have you already tried? Maybe I can make a recommendation. I am a side sleeper. My big belly has me on my side because on my back I have difficulty breathing. I’ve gone thru these mattresses: Brooklyn Bed, Layla, Nectar, Purple, Tuft & Needle and a pure latex from Habitat Furnishings. (All in size Twin XL) I’m currently on the Nectar which is the best so far, but I still begin to wake up around 4 AM, finally getting up at 5 AM because of backaches. It seems after about 6 hours I just can’t stay in bed anymore. So… I’m now looking at a Sleep Number with hopes of getting some better, more comfortable sleep. I would LOVE to wake up without a backache! FYI, I also tried My Pillow which didn’t seem to help me any. My current pillow is one included with the Nectar mattress, I like its support. I purchased a Reverie adjustable base. It has two sides, each perfect for a Twin XL mattress. My wife and I have a King frame, now we’re sleeping on Twin XL mattresses. I am considering a Sleep Number c4 in King to replace our current two Twin XL mattresses. I hope this info helps you with a possible recommendation. I’m beginning to think that this is just the way my sleeping is going to be… bummer. I did chat with Sleep Number concerning returns. Here is their reply: “For returns, we would have the option to pick up the order for you for $199 or we can provide you with UPS return labels that are $29.99 each. ” They also charge $89.99 for delivery. Hi Val, I think Sleep Number is a good next step because (assuming you get one with dual air chambers) you will both be able to control the overall firmness and support of your side of the bed. If you go to the store I think they can help you find the right Sleep Number setting to get started but you can always adjust from there. I’m not sure what your budget is but I have heard the P5 model is the most popular. Good luck! Katie, thanks for your suggestion, I’ll go check out the Sleep Number beds with an eye on their P5. I bought the Sleep Number bed with the i8 mattress three years ago. My wife and I both usually wake up in the morning with bad back pain. We are thinking that a firmer mattress may be better for our backs. We are looking to buy a new mattress and considering possibly the C4 or P5 or others. Do you have a recommendation for us. Hi Ron, are you changing your sleep number setting to make the bed any firmer or are the foam layers in your i8 mattress sagging? I ask because if you’re adjusting the firmness and still feeling back pain you may have foam issues that could be covered by your limited warranty. I’d check that out first. If you’re set on a new bed, I know that the p5 is the most popular model and the more basic C-2 and C-4 are also nice options because they’re going to be on the firmer end with fewer plush layers between you and the air chambers. Some people choose to go with the most basic C-2 and add a memory foam topper if it ends up being too firm (sounds like that might not be a problem for you, though! ).